Patti wrote: There is only one delta location. so there is no need to refer to the rule. A straight line is only a horizontal plane when it's horizontal! It would have been easy for them to say, the angle of the side open to the core must be no less or no more than such and such degrees but they do not. Because it is not the SIDE that is open to the core. It's the bifurcation itself, the split, the fork, the V.
There is nothing that says a bifurcation or triradius must have the most narrow angle open to it. I'm not sure why you keep bringing triradii into it. The rule only applies to bifurcations, not triradii. No, this is not an individual thing at all... because the 'open to the core'-concept is directly connect with the fact that they are speaing about a BIFURCATION. Obvously, you don't recognize that it IS common sense... but the problem here is as well that you also didn't recognize that this concept was ONLY meant for the situation of 'multiple bifurcations' as well. And therefore your 'need' for an explicite description of what they actually mean with 'open to core'... is probably because you are obviously struggling with the issue of the angles - resulting in statements about that 180 degrees is like a 'straight line' (which is basically only like saying: '1 + 1 = 2'). So, the answer to your 'request' (about: "why didn't they write angle-this or angle-that ...") is found in the fact that they are only using that concept for prints when there are multiple 'bifurcations' - without a TRIRADIUS. NOTICE: For example, they also did not mention that IF the multiple 'bifurcations' were featured with a TRIRADIUS (not far away of course)... then the DELTA would be located at the triradius. But they did not describe this ... because this is only common sense as well - and therefore they did not write this either. Only in F can you tell which side is open to the core. This had been the subject and references we were on. We were talking about triradii. This is the object or focal point the medical community tells you to look for. What I see them telling us to look for is the 3 converging parallel paths, be it ridges or spaces as channels or canals, with a real or imaginary center point. If these 3 converging paths are unequal, but the only object centered out in front of the diverging parallel ridges, entering the pattern area; they would not move the delta to the next inner ridge unless there is a ridge like in fig 55 of Science of Fingerprints. We are both agreeing that they are narrowing it down to one final delta location...a best choice? "● The delta may not be located at a bifurcation which does not open toward the core", can you show a bifurcation that they show a bifurcation not being used that is found in the otherwise correct location (centered in front of parallel type lines). I showed examples where they are and the most narrow side isn't open to the core. sorry Patti, I am not understanding you well! If we were in the same room I'm sure we'd understand each other much better, it's more difficult in written communication! Yes, we were talking about triradii - 3 radiant ridges roughly at angles of 120 degrees to each other. But regarding "open to the core" we were talking about bifurcations, forking ridge line. I'm having difficulty understanding why you keep mentioning triradius being "Open to the core", because "open to the core" is not a consideration in triradii. Yes, the diagrams are showing us where to find the delta or 'triradial point' located within the triradius. Sorry, can you explain again the bit I've underlined, as I don't understand what you are saying. I agree with 'in the same room'. Each time there's a post where I see that we're all talking apples, oranges and bananas to each other it's frustrating to say the least. Regarding the underlined sentence, reading it myself this morning, I can see it isn't well composed. I was trying to say that the first obstruction that is 'centered at or in front of the diverging parallel lines' is the best choice for a delta. It could be an object with 3 branches sticking out in 3 directions. If those three branches are about equally 120 degrees apart they are called a triradius. If two of those branches are closer together and going pretty much in the same direction, it is a bifurcation. If either of these are out in front of the diverging parallel lines, either could be without a doubt a delta. If either the triradius, or the bifurcation is positioned so that a branch is touching the next branch, in line with the core, it would cause the same effect as in fig. 55. It wouldn't matter if it came under the description of equally spaced triradius or not equally spaced bifurcation. Both have 3 branches and 3 open spaces. The same rules apply as to when the delta is placed at the center of the converging branches of each, or when the delta is placed at the end of one of their branches. A delta can be a point on a triradius the same as it can be a point on a bifurcation. Both are made of the same components, just different spacing. A triradius can be seen as a bifurcation because of it's 3 sides. 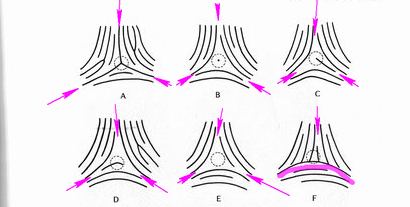 A bifurcation is 1 ridge splitting. So the ridges that look like a V are often a Y with one very short stem. A V shape could be two abutting ridges. It seems to me that the reason for finding the core, with specific instructions for lining it up with a point from the entrance of the diverging lines, goes with the dynamics involved at development. The center of the pattern forms first. All other sides have to close in on and wrap around the center. With a good print we should be able to see where the developing ridges from the outer edges of the fingertip meet with the central pattern. The type line radiants and the radiants of the triradius are not the same. The radiants of the triradius must be inside the type lines. That's why we are talking apples and oranges!!! The medical community skip identifying the type lines other than looking for the parallel ridges opening into the pattern area. Then they use the triradius and it's radiants. The reason is neither are counted in the ridge count. It's their short cut. Patti wrote: The type line radiants and the radiants of the triradius are not the same. The radiants of the triradius must be inside the type lines. AHA!!!! exactly, That's why we are talking apples and oranges!!! The type line radiants ARE the radiants of the triradius! I am talking about a triradius as being the meeting area of where the parallel lines diverge, from 3 directions, that form a kind of triangle shape with curved sides. You can trace along two of these diverging lines from the triradius, and these are the type lines. I now understand that, when using the term 'triradius' we've been talking about different things!!! When I came back to post this I saw that you had just posted. I haven't read completely your post, but I think we're thinking on the same line. Here the lines drawn down the middle are not the type lines. The type lines are formed by two ridges that run parallel and diverge. Copying here the diagram you posted on another discussion. You can clearly see on most of the diagrams how the type lines come from the triradius. I had scanned it before I posted my last post, then the phone rang and other priorities came forward and now when I come back, you have already posted to that regard!! The drawn markings and underlinings are from when I was first reading this years ago, not related to our conversation. This is where delta, type lines and triradius become interchangeable for the medical community, but not for the forensic. I don't remember which book I was reading about dgs recently that explained that it was for convenience since the ridge count doesn't start until past the delta. So to them it's all the same. Lynn wrote: Copying here the diagram you posted on another discussion. You can clearly see on most of the diagrams how the type lines come from the triradius. The following scan is from Schaumann & Alter "Dermatoglyphics in Medical Disorders"
They refer to the illustration above as Fig. 3.3 in their book. So thank you!! 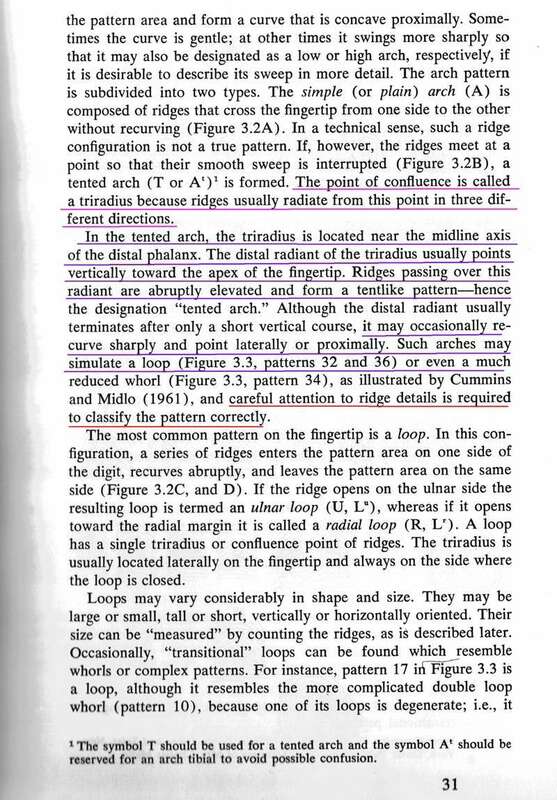 Where they say that the distal radiant is pointing vertically, that is similar to when a branch of a bifurcation is pointing out and touching the next ridge in line to the core (like fig. 55) and spoiling a white space between the two. "usually points vertically toward the apex of the fingertip" This is the location called the core. *This* ridge in line with the core is an indication that we are most likely looking at a tented arch pattern that looks like a loop. When we get to the top of the straight line, obvious in Disney's 1933 print and right index finger, there is a lateral ridge. You must imagine that the lateral ridge connects proximally with the rising ridge (in the white space) but it may not. Patti, your 'indication' is not described by the text at all. There are no rules regarding the direction of the upward branch comming from the DELTA.. In loops with a low ridge count it is only normal that DELTA is not far away from the central axis of the finger, and that the upward branch comming from the DELTA is pointing not far away from the core (as seen in figure 3.7 at page 37 in Schaumann & Alter). But especially figure 181 + 182 in the F.B.I. 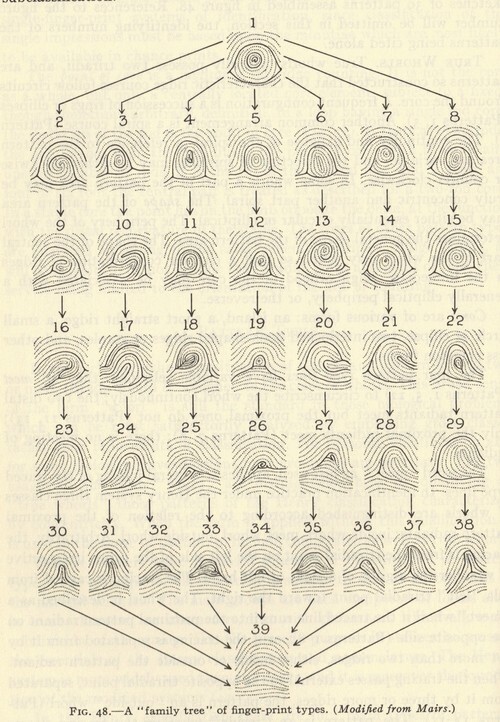 book show a likewise characteristic - regarding the direction of the upward branch - as seen in the Disney-print, but figure 181 + 182 are classified as well classified as LOOPS. So, what you described as an 'indication' - is no SIGNIFICANT indication at all, because after locating the 'delta', the 'core', and whether there is a 'sufficient recurve'... you only have to count the ridges between the 'delta' and the 'core' in order to classify the pattern. "Loops may vary considerably in shape and size. They may be large of small, tall or short, vertically or horizontally oriented. Their size can be "measured" by counting the ridges, as is described later." It depends on which system you use. If you use the medical communities' system then they are looking at the centrally placed triradius forming the tented arch. Type lines are formed by the triradius. 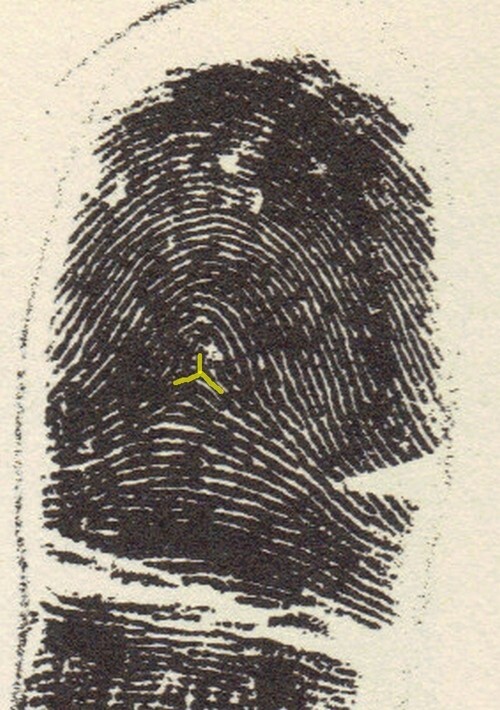 If you work with "The Science of Fingerprints" then you must use their rules for locating the delta and the centrally placed triradius is not relevant. Type lines are formed by the parallel diverging ridges surrounding the pattern with the delta in the pattern area. I don't think it's a good idea to intermix the systems for our individual purposes. You have misunderstood what I am describing as a radiant aiming at the core. Of course it's not in the books. It's a result of what they describe. Medical community sees a centrally placed triradius with an upthrust aimed at the apex - a tented arch. Forensic community tells us a ridge that is in direct line between the delta and the next ridge lined up to the core spoils that next ridge for the count. There is something similar there, if you visualize what they are describing. No Patti, the result does not depend on which system one uses. Because I already described how your 'indication' is not the result of what they describe... it is a result of how you read there words: an 'associative interpretation'. 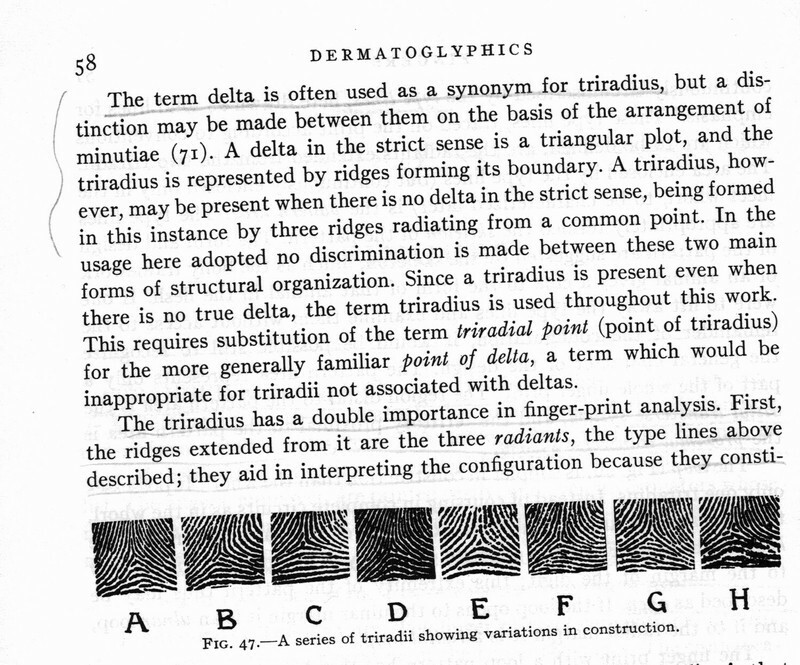 I see only a difference on two minor aspects: (1) the definition of the 'type lines', and (2) the issue: 'can the DELTA be located outside the ink ridge?' (F.B.I. says: 'no', the medical researchers say: 'yes'). But both issue are only minor differences that have no consequences at all for the pattern assessment, because in the definition described by the F.B.I. the 'type lines' are for sure adressed to other lines - that are positioned more outward (than in the definition of the medical researchers). And finally, I have tried to apply both methods... resulting in the same result: Disney has a RADIAL LOOP (featured with: FBI - 'ridge count = 2'; medical researchers - 'ridge count = 3' - though it would make sense not to count the first ridge line, because in that situation we are actually using an imaginary point) - which makes sense in the perspective of the minor differences that I just described. Therefore ...I conclude that both methods result in EXACTLY the same result for the Disney print. Patti, in your analysis you appear to suggest that both methods could result in a different fingerprint type classification. But I think that is only the result of your 'interpretations', because: have you ever seen a report which describes that both methods CAN result in different fingerprint pattern assessments...? I have never seen such a report, and I think you have not seen such reports as well. Correct? PS. Though I admit... IF such reports are available, it would for sure become relevant to look at the details. But again, so far I don't think it is likely that such reports are available. Well, if you were actually reading my posts rather than reacting to them, you would notice I continuously repeat that the similarity is in the ridge count, which always starts after the delta in both. So you are waaaay wrong in your final analysis, of what I think, and of Disney's fingerprint. Patti, great that at last I managed to explain to you what I was talking about re triradius, and I think you understand it the same way now? Patti wrote: Martijn, It depends on which system you use. Ok, another thing to spell out to me please! I've mentioned it before in regard to Richard Unger's work. Patti what exactly do you mean by "centrally placed triradius" ? In a tented arch the triradius is centrally placed within the pattern of the fingerprint. Therefore in an obvious tented arch, you can draw a straight vertical line from the triradial point or delta, to the core, (the classic 'tent pole'), and the ridges curve over the top of the tent pole. 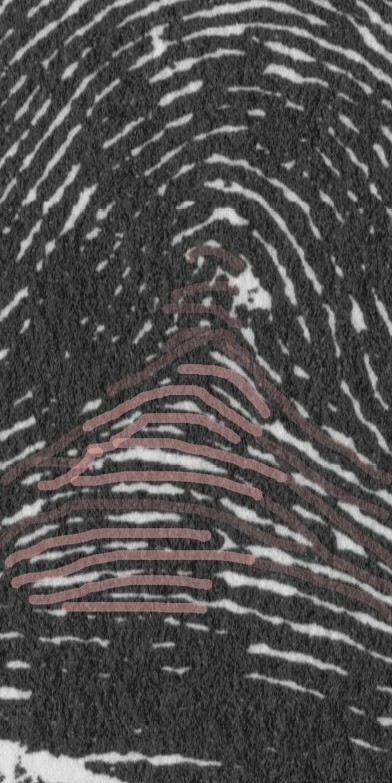 Whereas Richard classes a "centrally placed triradius" as central within the width of the finger, regardless whether the pattern is around it or to one side. In the Disney print, the triradius is not centrally placed within the pattern, there are recurves to one side. Looking at it from the medical/scientific sources who talk about triradius, Disney's print to me is obviously a radial loop. This is the position I started from on page one of the discussion because I already understood triradii, and that is the way I have always looked at fingerprints. I find it more confusing because they don't talk about triradius. We have discovered that the FBI rules are very complicated, but I think we have done a damn good job in trying to understand them! So, Martijn - like Patti I am also seeing a different way of looking at it from the two perspectives. I have never seen a report which describes that both methods can result in different fingerprint pattern assessments, but I can't arrive at an assessment from FBI book! From FBI point of view, my see-saw last landed on tented arch, and didn't move because I don't understand Loesch's parabolas, placement of shoulders etc. and FBI don't mention triradius. I'm not sure why the considerations we've been discussing for 40 pages are now apparently irrelevant! The above is what I see that looks like a very centrally placed triradius. I'm going to still side with the FBI's classification as tented arch. I agree with the medical communities' approach to the central triradius as well, which I see as supporting a tented arch. I actually haven't seen any final support for any ridge counts when the focal points are accurately placed using the forensic method. Lynn, both methods provide us 'tools' to find the ONE correct assessment. If you say, that one of these methods 'clearly' results in the assessment 'radial loop'... then there is only one possibility: that the other method SHOULD result in the same assessment (UNLESS there had been clear evidence that this was not the case here). Because, we can safely assume that when both methods are applied CORRECTLY... then each of both methods should always result in the same assessment! If not, that would only provide a clue... that something went wrong with how you applied the rules! But okay Lynn, I can understand that you like to play it via your 'formal' statement that you indecisive regarding the perspective described in the F.B.I. book - and obviously, your indecisiveness can be adressed to the issue with the shoulder line (which is rather complex indeed). Anyway, thanks for the many hours that you invested in this discussion. And with your input & assistance I think we all learned at lot! sorry that is a slightly hysterical laugh from me !.... 40 pages of discussion and I'm still not sure that FBI methods have been applied correctly! I notice you conclude that "... then each of both methods should always result in the same assessment! If not, that would only provide a clue... that something went wrong with how you applied the rules!" ! ah Ok, so it's me who is wrong. If you've applied them correctly Martijn, I congratulate you. I guess that's a for me then. I'm not 'playing it', I don't understand the final part of your FBI assessment. However I am happily confident in medical/scientific approach of a radial loop. 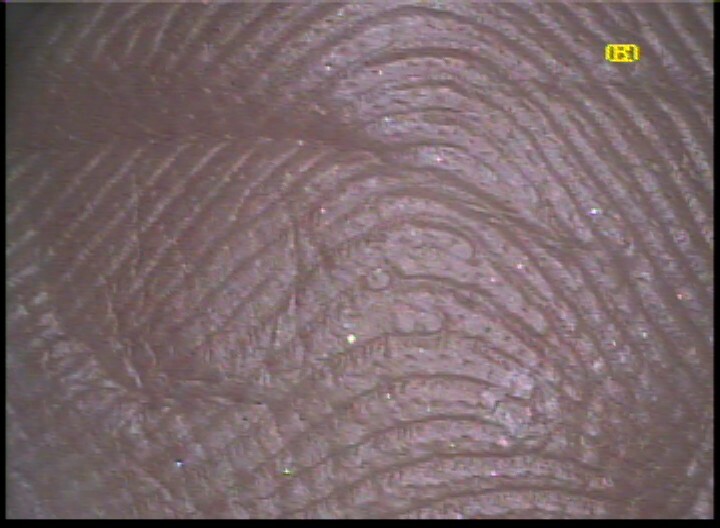 Oh but wait... we haven't discussed the laddering nature of the center of the proximal pattern of Disney's fingerprint! Notice how down the center you can count quite a few more ridges than on the sides. Laddering was mentioned in the slide shows at the link that Lynn shared in relation to the formation of the ridges in arches. In some of the places that one may imagine too much ink, one may also see what's there as really there.